Jimmy and his sister search for their hidden savings. After my last post, I decided to read the synopses of the other Stooges episodes to see if I could find any other with representations of people with disabilities… and indeed, I did. 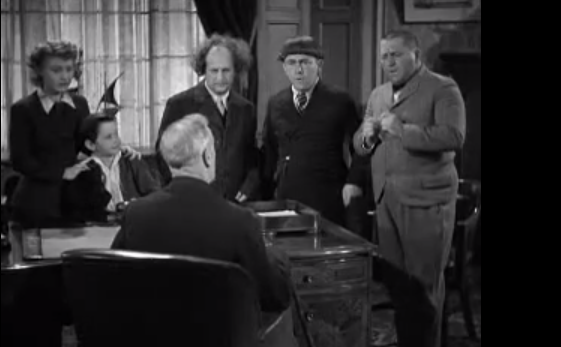 The 1937 short, “Cash and Carry” is summarized by “Larry, Moe, and Curly blat into the U.S. Treasury in order to help a poor girl’s disabled brother” (taken from The Three Stooges Collection Volume 2: 1937-1939). 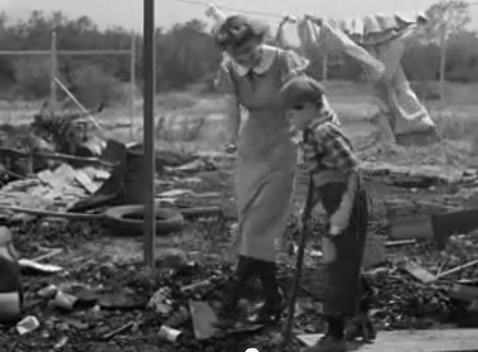 When the Stooges return to their home in the junkyard, they find a little boy doing homework at their kitchen table. After telling him to get out of their apartment, he apologizes for him and his sister (they didn’t know the home belonged to anyone) and gets up to walk away. The shot then cuts to the other side of the kitchen table where we see the boy stand up and begin to limp out the door with the aide of a crutch. Moe takes over the situation by stopping the boy and telling him that they made a mistake calling this place their house because “they didn’t have any curtains,” so they couldn’t lay any claim to it. After he sits back down to do his homework, Larry, Moe, and Curly go outside to look for a new tire in the garbage heap outside their door. Instead of finding a tire for their jalopy, they find a can filled with bills and coins totaling $62. This find sets them off searching the junkyard for other cans with money thrown away in it. Meanwhile, the little boy and his gorgeous older sister go outside to add some more money to their secret coin can, only to find it missing. After a short debacle, The Stooges return the money to the sister who explains that they’re “saving up $500 so we can get Jimmy’s leg fixed up so that he can walk like the other boys.” The Stooges decide to lend a helping hand by “investing” the money in a fallen down property, tunnel through the basement wall and find themselves accidentally in the U.S. Treasury (though they think they’ve stumbled upon buried treasure). “Mr. President” personally sees to Jimmy’s procedure. While the initial portrayal of Jimmy is certainly an interesting one, he’s young, innocent, and just wants to fit in with his peers, the last thirty seconds of the episode seem to be the most prescriptive in terms of disability rights and models. Because those “knuckleheads” broke into The Treasury, the President of the United States hears about it and lets them tell their story. At the end of this tale the President tells Jimmy that he “shall arrange personally for you to have your operation” and lets Moe, Larry, and Curly off scot-free. Such an ending encourages the view that personal charity is the solution for disability (as opposed to the social model that stresses equal access and rights), encourages individuals to find a medical “cure” for whatever sets them apart from the masses, and allows the expensive procedure to remain unquestioned because Jimmy now has a wealthy donor to sponsor him. Like I acknowledged in my previous post… this short is obviously made for its comedic insights, but there is still much to be said about the type of message it propagates to viewers and the type of socio/political climate it is reflective of.